Semiconductor Engineering - 200mm Crisis? Semiconductor Engineering - 200mm Crisis? Home > Manufacturing, Packaging & Materials > 200mm Crisis? Demand is up, capacity is flat. A look at what’s behind this imbalance. Over the last year or so, the IC industry has experienced an acute shortage of both 200mm fab capacity and 200mm equipment amid a surge of demand for certain chips. Right now, though, the 200mm shortfall is much worse than before. But this situation isn’t expected to improve for both elements in the second half of 2017, and perhaps beyond. That’s good news in one respect—chipmakers want to keep their fabs full to maximize profits. The downside is they can’t take advantage of soaring demand. Chipmakers have been looking to expand their 200mm fab capacities, and some in China are readying new 200mm fabs to meet demand. But there is hardly any new or used 200mm equipment available. Where tools are available, prices are relatively high. The term “core” refers to a piece of used equipment that must be refurbished. A year ago, there were 600 to 720 pieces of 200mm used equipment or cores in inventory. At the time, there was demand for about 1,000 200mm cores among device makers, according to SurplusGlobal, one of the world’s largest suppliers of secondary equipment. Right now, there are still less than 1,000 200mm cores that are available, according to SurplusGlobal. But now there is a demand for somewhere between 3,000 to 5,000 200mm cores from chipmakers, a three- to five-fold increase over last year, according to estimates from the company. The 200mm crunch isn’t a short-term event, however. “We perceive that 200mm demand will continue for at least the next two to three years,” Greig said. • Over the years, several chipmakers closed many of their 200mm fabs for cost reasons. Some decided to focus on the bigger 300mm market. • Several equipment companies went out of business or were acquired over the years. Many vendors decided to stop building certain types of legacy tools. • Demand for chips made in 200mm fabs exploded, especially in the automotive, communications and mobile markets. 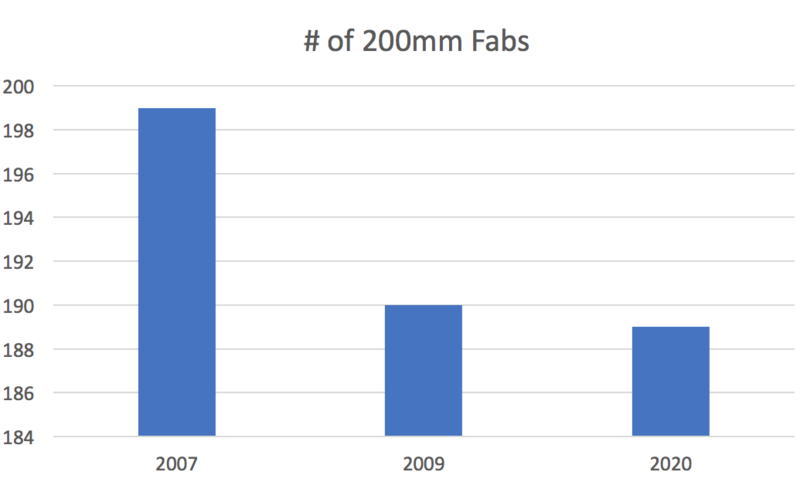 Amazingly, despite appearing several decades ago, 200mm fabs are hot commodities today. At present, China is building most of the new 200mm fabs in the industry. In addition, several foundries and integrated device manufacturers (IDMs) are adding new 200mm fab capacity. One way to get a handle on 200mm is to look at wafer starts per month (wspm), processes, utilization rates, and product types. For starters, a typical 200mm fab produces around 40,000 wspm. Generally, a 200mm fab produces a multitude of chips in various processes, ranging from 6-micron to 65nm. MCUs, MEMS, MOSFETs, power management ICs and RF devices are just a few of the products running in a 200mm fab. Citing demand for 200mm chips, the industry is projected to add 80,000 to 100,000 wspm of 200mm fab capacity per year through 2020, according to Rosa. “That’s 2.5 fabs worth of equipment every year for the next four or so years,” he said. For 200mm, the industry is projected to produce a total of 5.2 million wspm in 2017 and 5.3 million wspm in 2018, according to analysts. “Capacity is expected to be about 5.5 million wspm by the end of 2020,” SEMI’s Dieseldorff said. 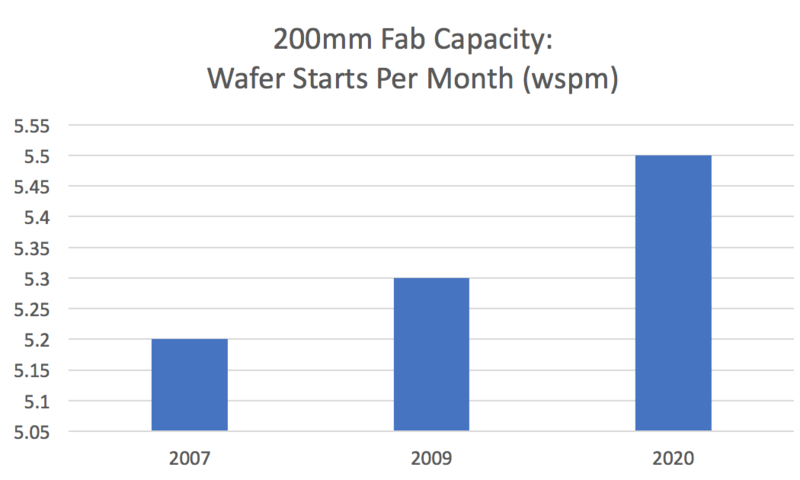 All told, wafer starts are rising in 200mm fabs, but ASPs are declining at a faster rate. So in total, the revenue from 200mm fabs is growing at a modest rate of 2% a year, he said. Compounding these issues, chipmakers also are wrestling with various product mixes in 200mm. These fall into three different categories. The first involve chips that are well suited for 200mm. “They do not gain any advantages in transitioning to a more advanced technology, but the overall market demand continues to grow, such as discrete power MOSFETs,” UMC’s Ng said. The second category involves products that will remain at 200mm, but which require more advanced processes at that wafer size. This includes display drivers and controllers, for example. Of the fewer than 1,000 200mm cores available on the open market, though, many are outdated or beyond the repair. The shortages are across the board, but etch, lithography and metrology tools are the hardest to find. Spare parts for 200mm tools are also scarce. So where can you buy 200mm equipment and spares? Typically, chipmakers can buy used gear from fab equipment makers, used equipment companies, brokers, or through online sites such as eBay. Some chipmakers also sell used equipment on the open market. For years, Applied Materials, ASML, KLA-Tencor, Lam Research, TEL and other equipment makers have been in the business of refurbishing and selling their own gear. In recent times, though, Applied, Lam and TEL began making new 200mm equipment amid soaring demand in the business. Last year, Lam Research and Manz AG formed a joint venture, dubbed Talus Manufacturing. Talus is a global refurbishment center in Taiwan. Talus will upgrade and refurbish Lam’s equipment to fulfill customer demands in Taiwan and globally. KLA-Tencor itself is taking steps to meet 200mm demand. It continues to provide refurbished equipment and has introduced several “remanufactured” systems in the market, such as a film metrology system (F5X), a bare wafer inspection tool (Surfscan SP2), and brightfield (2367) and darkfield (9150) wafer inspection systems. It is also addressing the spare parts issues. “We are working hard to mitigate part obsolescence issues through re-design of optics and electronic subsystems as well as operating system upgrades,” Odisho said. Working with an OEM has some disadvantages, however. They might charge a premium for a 200mm tool. The lead times are long. And some, but not all, equipment makers are pre-occupied with booming sales for 300mm gear today. So another avenue is to work with a third-party used equipment company or a broker. Generally, these companies obtain tools on the open market through various means. For example, a chipmaker has excess equipment and sells it on the open market, or an IC vendor shuts down a fab and puts the gear up for bid. Buying from used equipment firms can be a challenging process. Today, there are dozens of entities selling used gear. Some refurbish the tool and provide support. Others sell a system “as is” and you take it or leave it. Many used equipment firms are reputable, while others are questionable. In fact, there are a number of horror stories in the field in which a chipmaker will unknowingly buy a used tool that doesn’t work or is missing parts. Adding to the confusion is that some used equipment vendors are putting a new twist on the traditional business model. For example, SurplusGlobal recently announced what it calls a cluster. Based in Gyeonggi-do, South Korea, the cluster involves a large building, which consists of cleanroom and warehouse space. Both fab tool vendors and used equipment competitors can rent space from SurplusGlobal’s new cluster site, which will open in 2018. The goal of the cluster is to offer a one-stop shop of tools, spare parts and service for chipmakers in Korea and elsewhere. The selling point is that the new facility is near two large chipmakers—Samsung and SK Hynix. “In addition, we want to support China from Korea,” SurplusGlobal’s Greig said. Others are moving towards different models. Not long ago, ClassOne Equipment, a supplier of used tools, formed a unit called ClassOne Technology. The new unit is developing new 200mm equipment under its own brand name. The concept is simple. Over the years, many large equipment makers exited from various legacy tool markets, leaving some chipmakers in a pinch. So ClassOne Technology can fill the gap in some markets, according to Kevin Witt, president of the unit. The best solution: Do your homework. “If a deal is too good to believe, it usually is,” he added. I am not surprised that metrology and steppers are a stumbling block. With 300 mm now in full swing, life extension on 200 mm is going to become more of a problem, especially for more complicated machines. Inspection standards were also less stringent for 200 mm. I suspect there are still plenty of 100-150 mm fabs in operation for “gum drop” products. Parts for these machines must be a thriving cottage industry (think implanter ion sources). For once the equipment manufacturers are not competing against themselves. How big is the cost differential these days between 200 and 300 mm? If it is shrinking, maybe used 300 mm makes more sense than 200 mm, although it means new mask sets. As I read this I sit in a GM owned Wafer fab full of idle and near idle 200mm. General Motors plans to close this facility by the end of the year because 200mm is of no value according to the powers that be. Does the fab make ICs or is this silicon wafer making? Joe! You are in Kokomo, right?